Eat your heart out, NYC! 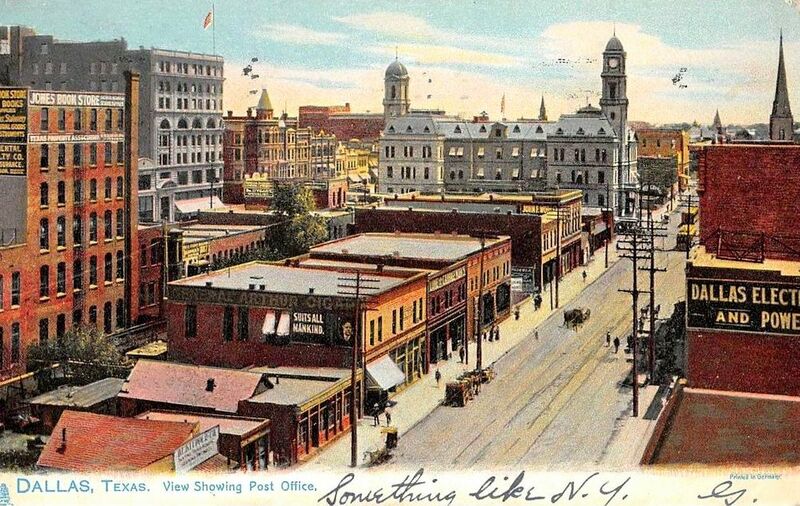 This view to the east on Commerce likely dates from 1912 or 1913. The Jones Book Store, seen on the left, opened in 1912, and construction of the first part of Neiman Marcus’s new store at Main and Ervay, to be occupied in 1914, has’t (as far as I can tell) begun. There were a certain number of motor vehicles in Dallas by this period, and you’d think a few would be in evidence on Commerce. There would be many automobiles on the streets if this were as late as 1912. Why do you say that the Jones Book Store opened in 1912? It’s mentioned on Main Street in The Dallas Morning News as far back as March of 1886. I think this may be around 1904 when (I *think*) the post office/federal building tower was completed on the Main St. side. The date 1912 was picked up from an item in a 1912 issue of Publishers’ Weekly, which noted that “the Jones Book Store, a partnership composed of R.L. Thornton and C.H. Bracey” had just been incorporated. I’m sure your 1886 date is correct, and the phrasing in PW reflected the fact they weren’t a Dallas publication or because Thornton and Bracey had sent them a press release emphasizing their involvement rather than dwelling on the store’s history. Curiously enough I have a fall-back position which dovetails well with your 1904 date for the post office. The Wilson Building, the gray mass in the upper left of the image, was also completed in that year.